Quick note: we’re going to start merging the engineering updates together with leadership updates into one end of month post. Typically, we’ve pushed engineering updates mid-month which made it a little hard to follow the timeline accurately. Po.et is building the verifiable web: the decentralized protocol suite for content attribution, discovery, monetization and reputation. When I think of January, I think of planning meetings and getting rid of the rust after the holidays. It’s typically not a very busy month. 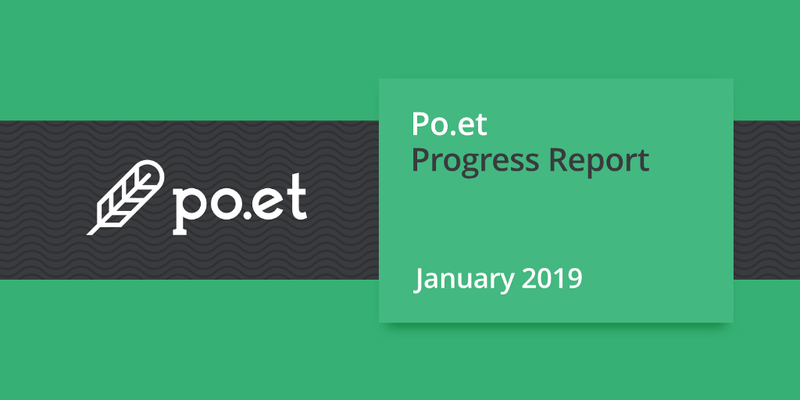 However, for Po.et, it’s been a great month to kick off 2019. The most important change we’ve seen to the team is Jarrod’s move to an advisor, rather than being the day-to-day leader. I want to personally thank Jarrod for being such a solid person to work with, but also for being a great friend to me and everyone on the team. He’ll forever be a part of Po.et’s story and will continue to be a fantastic member of our community. While we still have Jarrod, we’re cranking through some high-level strategic planning. We’re going to shift more focus into helping the community build solutions as the primary way to grow. In 2018, we had set out to go hard after major publishers and we afforded ourselves the chance to work on some amazing proof of concepts while forming some great partnerships which we think will bear fruit with time. I’ll be putting together some more complete thoughts about the path forward in the next few weeks.